1920's vintage classic brooch. Polished black onyx, sterling silver and pearl. 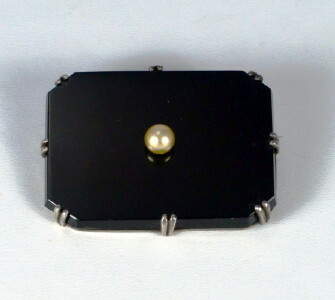 Rectangular brooch with cut corners. Sterling back, held by eight double prongs. Pearl is pin set at center. Marked sterling at back frame. Pin back with safety clasp. All original, true 1920's vintage.